In the wake of the death Andrew Breitbart, American advocates of liberty mournfully honor him as an exceptional American advocate of American Exceptionalism over Obama's American Acceptionalism. Andrew Breitbart well understood an anthropological truth reputed to have first been expressed by Bill Wichterman, Policy Advisor to the former Senate Majority Leader Bill Frist: "Politics is downstream from culture." In the wake of the death Andrew Breitbart, American advocates of liberty mournfully honor him as an exceptional American advocate of American Exceptionalism over Obama's American Acceptionalism. Andrew Breitbart well understood an anthropological truth reputed to have first been expressed by Bill Wichterman, Policy Advisor to the former Senate Majority Leader Bill Frist: "Politics is downstream from culture." Bill Whittle also not only well understood such truth but also created an excellent video explaining it. Breitbart dedicated his life to attempting to give how-to lessons (for affecting culture) to those of us who not only still understand how American Exceptionalism has advanced human civilization in general and principles of liberty in particular but who also understand how Obama's "American Acceptionalism" poses an intellectually existential threat to American Exceptionalism. 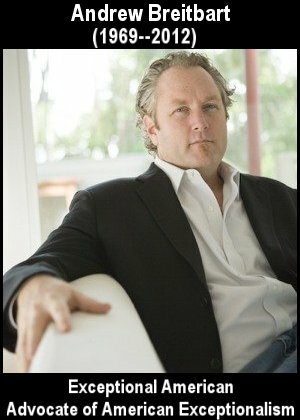 I never had the good fortune of meeting Andrew Breitbart, but as did most of us who advocate limited government at home and unapologetic American advocacy and activism abroad, I quickly recognized his leadership potential as well as his knowledge and abilities for communicating such principles to generations far younger than I. Although the legacy he leaves serves as a form of immortality for his ideas, his uniquely energetic and unapologetic support for, and defense of, such principles will be sorely missed. That must be a comfort (though surely not enough) for his surviving wife and children, to all of whom we all express our most profound sympathies.